If you are located outside the 48 U.S. States email for s/h cost. Cover Insulates your Mattress: That means your heating system doesn't turn on/off as much there for your heating system should have a longer life and that will also SAVE YOU $$$$ in your Electric Bill. 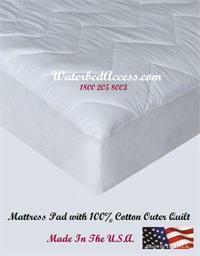 Mattress cover provides support; Which will increase comfort. Safety Vinyl Liner: This covers comes with a Safety liner; Which will catch water do to a spill or puncture. High quality stitching that will last for years. Mattress cover is off white with gold trim. "not actual color in picture"
The top does not unzip off from the bottom and this cover does not take the place of a mattress pad. You should still use a quality mattress pad under your sheets just like on any mattress. 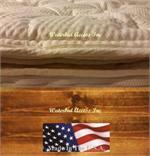 We have 100% cotton mattress pad in our linen category. The heater, liner and water mattress goes inside of the cover. And zip the mattress cover closed. If you are located outside the 48 states please email your location for s/h cost. Luxurious Bamboo Zipper Encasement Cover for Hardside waterbed has a quilted smooth top it is manufactured with a very high end Bamboo outer quilt/ hand picked. Bamboo increases air flow through the surface of your waterbed mattress much like cotton. 12 Mil Liner is allot more durable than the standard liners. It has reinforced corners Heater Compatible Black Bottom Easy to use Available in California King, Queen or super single Select water bed size when ordering. 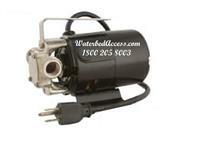 Utility Waterbed Pump perfect for water transfer & draining all size waterbeds. Pumps 360 Gallons p/hr. 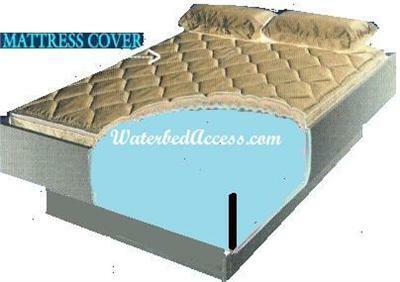 Will pump drain your waterbed mattress fast & easy. Electric water pump works w/ standard size hoses. FAST SHIPPING from NY, New York.